I am Jesus’ ・・・ ! 0 For the director of music. To [the tune of] “Lilies.” Of the Sons of Korah. A <maskil.>  A wedding song. 1 My heart is stirred by a noble theme as I recite my verses for the king; my tongue is the pen of a skillful writer. 2 You are the most excellent of men and your lips have been anointed with grace, since God has blessed you forever. 3 Gird your sword upon your side, O mighty one; clothe yourself with splendor and majesty. 6 Your throne, O God, will last for ever and ever; a scepter of justice will be the scepter of your kingdom. 7 You love righteousness and hate wickedness; therefore God, your God, has set you above your companions by anointing you with the oil of joy. 8 All your robes are fragrant with myrrh and aloes and cassia; from palaces adorned with ivory the music of the strings makes you glad. 9 Daughters of kings are among your honored women; at your right hand is the royal bride in gold of Ophir. 10 Listen, O daughter, consider and give ear: Forget your people and your father’s house. 11 The king is enthralled by your beauty; honor him, for he is your lord. 12 The Daughter of Tyre will come with a gift,  men of wealth will seek your favor. 13 All glorious is the princess within [her chamber]; her gown is interwoven with gold. 14 In embroidered garments she is led to the king; her virgin companions follow her and are brought to you. 15 They are led in with joy and gladness; they enter the palace of the king. 16 Your sons will take the place of your fathers; you will make them princes throughout the land. 17 I will perpetuate your memory through all generations; therefore the nations will praise you for ever and ever. 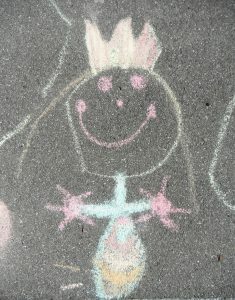 The church is described as the “bride” of Christ, but “princess” is a more accurate title. What God desires for us is to leave behind any thoughts that are not consistent with our new identity as princess, to follow Jesus, the king, and for us to join King Jesus in loving and ruling over the world justly. 1) What is this song about? 2) How does this song describe our relationship with Jesus?